A earache is one of the most common problems for any medical professional to encounter as ear aches in adults and children alike are very common. The pain caused by earaches can vary greatly from being mild and dull or constant or fleeting, or even a sharp and stabbing pain that comes and goes. There can also be a constant ache that fluctuates in severity causing other symptoms as well like headaches and nausea. A earache can therefore be quite problematic even in situations when it is not really serious or threatening. Swimmers ear for example can be quite discomforting, but it is not serious condition and can in fact be treated very easily. Other simple and non threatening conditions that could contribute to a earache problem include clogged ears due to an excessive buildup of wax or because of pressure changes as while travelling. A earache should however be treated very seriously and should never be neglected as at times it could be indicative of a more threatening problem. Even in situations where it is non threatening, neglecting a earache can lead to a worsening of the condition, resulting in irreversible damage to the auditory senses. A earache and the pain associated with are typically caused by swelling or inflammation of the structures within the ear, including the auditory canal, the middle ear and the tympanic membrane. The ear is one of the most important parts of the human body and is divided into three different sections: The outer ear, the middle ear and the inner ear. Hearing and balance are the two main functions performed by the human ear. Each section of the ear is used either for hearing or for balance. The most sensitive part of the ear is the ear drum. Earache is a common problem among children and adults. A earache is a common medical condition that can occur in absolutely anyone. Although earaches in children are a common and accepted aspect of early childhood, earaches in adults are also extremely common. It arises from an inflammation of the inner regions of the ear such as the external auditory canal and tympanic membrane. Earaches can either originate from an infection present in the outer ear canal, known as otitis externa, or from infection of the middle ear and eardrum, known as otitis media. Otitis externa occurs commonly after swimming and is also commonly known as swimmer’s ear. This condition is seen more commonly in children, although it can affect adults as well. Earaches are not always caused by circumstances or conditions that originate in the ear itself. Environmental conditions such as exposure to loud and continuous sounds or noise can also cause earaches and if these warning signs are ignored, continued exposure could even cause damage to the ears. Wearing ear muffs or protective ear plugs while working in environments with loud noise would be the most effective of all earache remedies for adults. Earaches can also be caused by mundane conditions like a common cold or throat and nose infections. In such cases earache relief can be obtained only through treatment of the underlying condition. In cases where there is an excessive ear wax buildup earache drops can work as an effective clogged ear remedy. There are plenty of natural earache remedies for children, babies and adults alike and these can be used quite effectively as a first resort or if you do not have access to any medical supplies. Earache remedies with olive oil are commonly used just like ear drops to relieve earache pressure and clogging. Middle earache remedies and earache remedies for kids often include ingredients like alcohol and vinegar. The effectiveness of home remedies can vary greatly however and it is advisable to seek medical treatment for earaches that cause significant discomfort or persist for more than a day or two. In the case of earaches affecting a baby too, it would be best to seek treatment from your doctor. 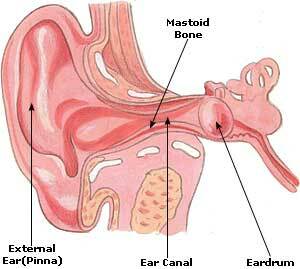 Depending upon the symptoms we can identify which section of the ear has problem. Both otitis externa and otitis media have different symptoms. Symptoms of otitis externa are mild itching or pain, swelling, thick discharge from the ear, hearing loss. The most common symptom of otitis media is mild pain in the ear. Besides this, some other symptoms are fever, hearing loss and occasional discharge from the ears. Infants may show symptoms like diarrhea, poor feeding, irritability and so on. Earache is one of the symptoms of an ear infection. The other earache symptoms in case of infection include inflammation, pain, pressure, redness and swelling. Symptoms that are specific to otitis externa include gradual onset of ear pain, slight itching, hearing difficulty, ringing in the ear, swelling, blocked sensation in the ear and drainage of thick fluid from the ear canal. Otitis media may lead to symptoms such as ear pain, hearing loss, buzzing sounds in the ear, ear blockage, fever and discharge from the ear. Children may also display fussiness and irritability as they may be unable to localize the pain. In younger children, symptoms such as vomiting, diarrhea, problems in feeding and sleeping may also take place. In case of myringitis, the pain may be severe. The pain may also suddenly ease if the ear drum ruptures and relieves the pressure. Other symptoms of myringitis include hearing loss, pain, swelling and blood tinted drainage. The two main causes of earaches are the infection of the outer ear and the middle ear called otitis externa and otitis media in medical parlance. Otitis externa is the skin infection of the ear canal which often occurs after swimming. It is also called swimmer's ear. Otitis media is the infection of the middle ear and eardrum. It is commonly seen in infants and children. Ear ache may also be caused due to ear infection or any ear disease, nose, mouth, or throat infection, injury to jaw bones, an insect in the ear, fungus growth in the ear, wax buildup in the ear and so on. There are various possible earache causes that could even include toothaches, which also trigger severe headaches. Otitis externa is often caused by moisture accumulating in the ear canal. Damage to the ear canal due to injury can also lead to infections of the outer ear. The risk of contracting otitis externa is high in those who swim regularly. It can also occur after bathing or due to humidity, and hot climates. The bacteria that are responsible for the ear infection thrive in warm and moist conditions and hence find an ideal breeding place in the ear canal. In rare cases, otitis externa may be due to fungi. Small scrapes or minor bruises that affect the ear may also lead to infection. This may occur if objects like paper clips or even cotton swabs are inserted inside the ear to clean it. The ruptures or tears that could be present on the skin may permit some bacteria to enter and cause infection. Otitis externa symptoms may be confused with other types of earaches, but if diagnosed properly, treatment is simple and effective. Otitis media may develop on account of bacterial or viral infections in the middle ear. It commonly occurs after infections of the respiratory tract or even after a cold. Such infections may lead to inflammation of the Eustachian tube which is responsible for drainage of fluids from the middle ear. Other risk factors for otitis media include heredity, allergies, exposure to smoke, anatomical abnormalities of the neck and head and bottle feeding while lying flat. Earaches may also be caused by myringitis, which is inflammation and swelling of the ear drum due to trauma or infection. The ear drum may get affected when objects are inserted into the ear for removing the wax. Changes in pressure, travelling by air and loud noises can also damage the ear drum and lead to myringitis. Blistering and inflammation of the ear drum may sometimes also occur due to viral and bacterial infections. Because of the variety of possible causes and various types of earaches, the cause needs to be identified accurately for earache treatment to be effective, but for some quick earache pain relief, natural earache home remedies can suffice. Otitis externa and myringitis usually require medical care. Otitis media may get better on its own through pain alleviation and home care, but ear infection remedies are not always effective. In case of a earache that persists for a few hours and increases in intensity, a doctor should be consulted. Also, a earache that is accompanied by fever and hearing loss must be examined by a doctor. Although there are some effective home remedies for earaches, it is advisable to seek medical care for earaches in babies, particularly if accompanied by symptoms like fever. Individuals with compromised immunity or diabetes must also seek medical attention for a earache in order to rule out a more serious condition known as malignant otitis externa. The root of a earache is usually diagnosed after reviewing the patient’s history. A complete medical exam, x-rays as also other tests may be conducted. Pour some garlic juice in the affected ear; its analgesic properties will help to relieve the pain. If your earache is due to a rise in altitude than just chew some gum or try yawning. This will contract the muscles and open the Eustachian tubes. For swimmer's ear, put some mineral oil in both ears before going in the water. Apply some heat to your aching ear using a heating pad or a warm cloth. Put few drops of hydrogen peroxide in the aching ear. Put two drops of holy basil leaves’ juice in the aching ear. The pain arising from a earache may be alleviated through the use of anti-inflammatory and pain relieving medications. Earaches could also result from a clogged ear. An effective clogged ear remedy that you can use at home for pain reduction and to minimize discomfort is the application of a warm compress near the ear. The compress should not be very hot as this could burn the skin. The warmth helps to ease pain and swelling. Many individuals obtain benefit from ear infections and earache through simple home remedies. Garlic, olive oil, and vinegar are some ingredients common to almost any earache home remedy and can even be used as earache cures in children. A mixture of sesame oil and garlic is one such beneficial home remedy. Add a clove of garlic to a teaspoon of sesame oil and warm the mixture. Add 2 to 3 drops to the affected ear while lying down and allow it to remain for about ten minutes. You can also grind a few basil leaves and warm the paste slightly. Then add about four drops to the affected ear. The juice of mango leaves is known to help in easing earaches. Add some warm mango leaf juice to the ears before going to bed at night. Pouring a few drops of warm mustard oil into the ears is also known to help in treating an earache. Swimmers who are prone to developing ear infections may benefit from adding some mineral oil in both ears before going for a swim. Earache that occurs while travelling in an airplane is usually resolved by chewing on some gum or candy. This helps to exercise the throat muscles and relieves pressure from the ears. For relief from a earache olive oil is the most commonly sought after home cure. Apart from earaches olive oil can also cure buzzing in the ears. The olive oil should be only slightly warm before being put into the ear canal to relieve ear pain. A whole onion should be cooked till it is soft and then it should be wrapped in a piece of cloth and applied over the ear to provide relief from earache and dizziness. Leave it on for a few minutes and then apply to the other ear as well. Another good earache home treatment is juice freshly squeezed out from peppermint leaves. This juice can be inserted in the aching ear to provide pain relief. A pasty mixture prepared by warming licorice in some clarified butter is another good home remedy for earache and dizziness. This paste can be applied externally around the aching ear for quick relief from pain. Bishop’s weed oil can be warmed along with three times the quantity of sesame oil and used as ear drops to cure earache. 4-5 drops in each ear is good enough for curing earache. Another good earache home treatment can be prepared by warming tiny pieces of chopped radish in mustard oil and this oil can then be filtered into a glass bottle. In case of an earache, a few drops of this oil can be inserted into the affected ear to provide pain relief. Freshly extracted ginger juice can also be inserted directly into the ears to provide earache relief. Ginger has strong anti-inflammatory properties which are very effective in fighting ear infections and therefore providing quick pain relief. More often than not, a earache is a result of an ear infection. Take Vitamin C to boost your immune system. It is a natural antibiotic and antihistamine that helps to reduce inflammation and fever. Include zinc in your diet because it reduces ear infection. Certain foods, more commonly dairy products like milk, butter, cheese etc tend to aggravate ear infections, so it is better to avoid them during an ear infection. Clean your ear professionally regularly. This will remove all the dirt or any object which must be residing in and may cause problem later on. Use ear plugs during swimming to avoid water from entering your ear.